The Flower House – a lovely Greek holiday home and garden. The house sleeps 6 comfortably. The Flower House is on the Greek island of Euboea or Evia. 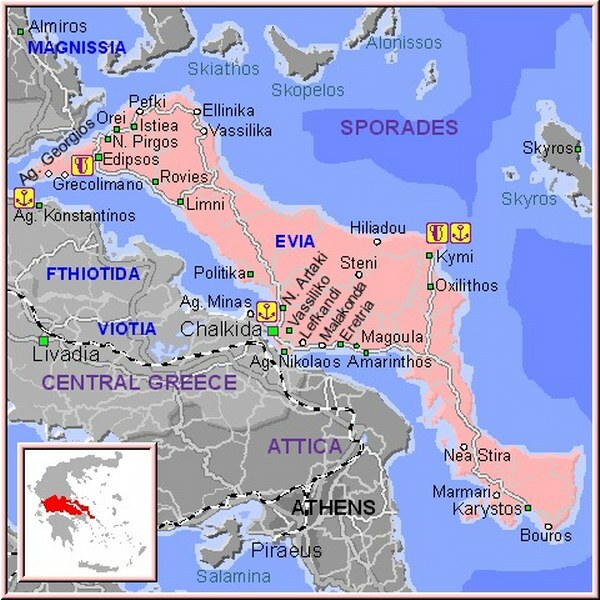 This little known island is in fact the second largest in Greece after Crete, being over 200 miles long (see map). It has retained its true Greek style in culture and in food and so is perfect for those wanting a holiday in a relaxed friendly atmosphere where the rush of the world is forgotten. The combination of beautiful beaches, crystal clear seas, ancient sites, forests and mountains with the lively tavernas, fresh food, wine and ouzo provides a first class self-catering destination. The Flower House is very convenient for Athens International Airport with the journey taking around 2 hours including 45 minutes on the Nea Styra ferry.